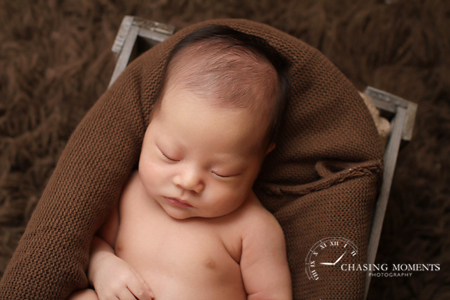 Chasing Moments Photography is Northern Virginia’s leading newborn photography and baby photography studio. Olga (the photographer behind Chasing Moments and the owner) has years of experience photographing and soothing newborns, and has done hundreds of newborn sessions for clients from Virginia, DC and Maryland. Her newborn photography philosophy is to approach each baby with utmost love and care in order to create peaceful, sweet and relaxed newborn photos. Typically, newborn sessions take place when Baby is between 6 days old and 2-3 weeks old, depending on Baby’s due date and actual birth date. I recommend scheduling your baby’s newborn photo session within 10-14 days of birth to achieve the beautiful “curled up” look and sleepy poses. 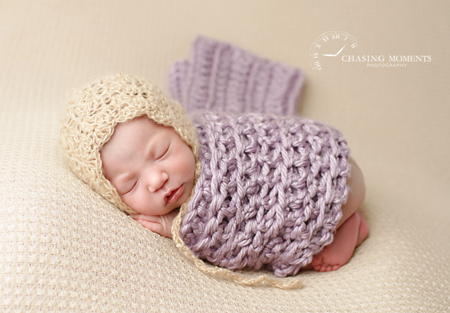 During newborn sessions I focus on a combination of (1) photos of Baby asleep on blankets or in props, using a variety of knit hats, custom-made headbands, and accessories (all of which I have available in my Reston studio), and (2) family photos of Baby with Mom and Dad and big brothers or sisters, if requested. A typical newborn session is about 2.5-3 hours, but can be as little as 1.5 and occasionally can go up to 3.5 hours. For twins and sessions involving toddlers, I recommend planning for a slightly longer session. For shots on blankets or with props, I will gently soothe Baby into sleep for poses that are natural and comfortable. I have extensive experience soothing babies based on years of newborn photography, workshops and education about Baby’s reflexes, physiology and safety, so please be assured that your Baby’s safety and comfort is my top priority. Furthermore, many newborn shots you see on this website are composites, meaning that multiple exposures were done with baby’s safety in mind (mom’s hands supporting baby, or “hovering” nearby”) and then combined in photoshop for the final look. My newborn photography sessions are “full service”, meaning that I will work with you prior to the session to get to know your likes, priorities and preferences. My studio is fully equipped with all the necessary props and equipment for the session, as well as all items necessary for Baby’s care. After the session, I will work with you on all your retouching requests, including major and minor retouches. I carefully proof and prepare each image individually for printing, and then review all prints and products before delivering them to you. I book newborn sessions as far as 6 months in advance and I only book a limited number of newborn sessions to make sure I am available whenever my little clients arrive. When I take on a newborn client, I put the due date on my calendar, ask mommy to contact me as soon as Baby is born and we finalize the session date at that time. If you love my work, and if you or someone you know is expecting, please call me at 202-251-6368 or email me at chasingmoments@gmail.com to schedule your newborn session!